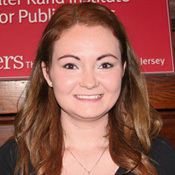 Tina Danielle Swenor graduated from Chestnut Hill College with a degree in Political Science in May of 2010 and from Rutgers School of Law—Camden in December of 2015. Tina hopes to work as a prosecutor in New Jersey after passing the NJ and PA bar exam. Page last updated by Senator Walter Rand Institute for Public Affairs at 12:38 pm August 2, 2016 . This page was printed from http://rand.camden.rutgers.edu/2015/09/16/swenor-tina/ at 4:51 PM Monday, April 22, 2019.